Preheat oven to 350 degrees. Line a baking sheet with parchment paper. (We used a 15” X 18” baking sheet.) Grease parchment paper with butter and dust lightly with flour. In a bowl sift together: flour, baking powder, cinnamon, ginger, nutmeg and salt. Separate egg yolks from whites. In one bowl, combine egg yolks and sugar. Beat at high speed until fluffy and light, about 2-3 minutes. Add pumpkin puree and mix until well blended. Slowly add in dry ingredients. (flour and spices) In another bowl, beat egg whites at high speed until stiff peaks form, about 3-5 minutes. With a rubber spatula, gently fold egg whites into pumpkin mixture to blend. Spread batter evenly in baking sheet. Bake at 350 degrees for 15 minutes. Remove cake from oven. Lightly grease another large piece of parchment paper and lay over top of cake. Gently flip cake with parchment paper over. Gently remove the top parchment paper. 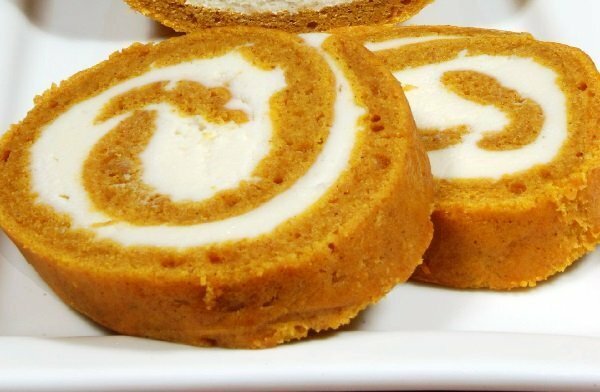 While still warm, roll the cake up from the shortest side. (with bottom parchment paper) Let cool for about 10 minutes. Meanwhile, make the filling. Beat together softened cream cheese, butter, powdered sugar and vanilla until light and fluffy. Carefully unroll the cake. Spread filling completely over cake. Gently remove the parchment and roll back up. Cover cake with saran wrap to keep roll tight. Refrigerate for at least 4-5 hours or overnight for easy slicing. Slice into 1 inch slices. Serves about 8-10.